Make a meal out of mac and cheese by adding cooked meat or vegetables before baking. While flour and butter are included in many recipes for macaroni and cheese, both can be left out without affecting either the flavor or the texture of the dish. Alternate methods include layering cooked and drained pasta with sliced or grated cheese, or making a sauce with just milk and melted cheese, both of which eliminate the two troublesome ingredients. A simple way to make macaroni and cheese involves creating layers of cooked and drained pasta with sliced or grated cheese in a large baking pan or casserole dish. Start with pasta and end with cheese. Once layered, pour a mixture of milk, eggs and seasoning about halfway up the sides of the pan, and then bake the dish at 400 degrees Fahrenheit for about 20 minutes or until the top layer of cheese is lightly browned and bubbly. Allowing it to rest for several minutes at room temperature gives the cheese and milk time to create its own sauce. 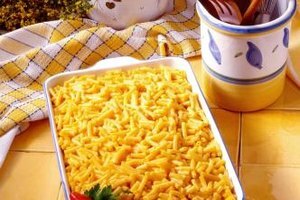 Another way to make macaroni and cheese is to toss hot cooked and drained pasta with shredded cheese directly in the baking pan. By using a variety of cheeses, the omission of butter and flour is not noticeable, as the dish turns out just as rich and creamy. Simply drain the pasta, place it in a casserole dish, stir in the cheese, and bake at 350 F for about 30 minutes or until the top is bubbling. You can also make a simple sauce with just cheese and milk by heating whole or 2 percent milk in a large saucepan and adding diced or shredded American or cheddar cheese, or a combination of your choice. Cook the sauce over very low heat until all the cheese has melted, stirring often, as it burns easily. Remove from heat as soon as the cheese is completely incorporated and the sauce is thick and smooth. Pour it over the drained pasta that has been transferred to a large baking dish, mix well and bake as you would any other macaroni and cheese. However, this style of macaroni and cheese does not need to be baked and can be served immediately after the cheese and pasta have been combined. You can also vary the dish in all its forms by mixing in diced cooked ham or lean ground beef, lobster, tuna, cooked pea or green beans, sliced cooked mushrooms, chopped green onions or canned and drained diced tomatoes before baking. Using different cheeses or a combination of two or more also adds interest and versatility to the dish.